Alfa Romeo gets ready to party, or at least that’s the message we’ve been getting since 24th of June when Sergio Marchionne revealed the all-new high-performance Giulia Quadrifoglio sedan. It was the preview of what’s expected to come in the coming months in an attempt to revive the brand and become a profit generator within FCA group. 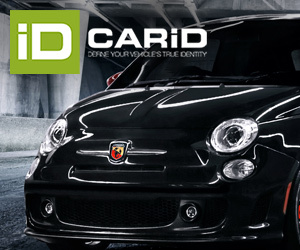 The brand wants to join the premium cars boom by offering a perfect mix between Italian design and technology, and sporty soul that will allow its rebirth in Europe and its real reintroduction in North America. Marchionne’s numbers target 400.000 units by the end 2018, or 6 more times the current sales figures in only 3 years. In terms of volume, Alfa’s target isn’t unreachable considering that the brand will play as a “local” in USA and premium segment keeps posting positive growth in many markets (with the scary exception of China). The problem is timing and the very slowly way FCA introduces the new cars. 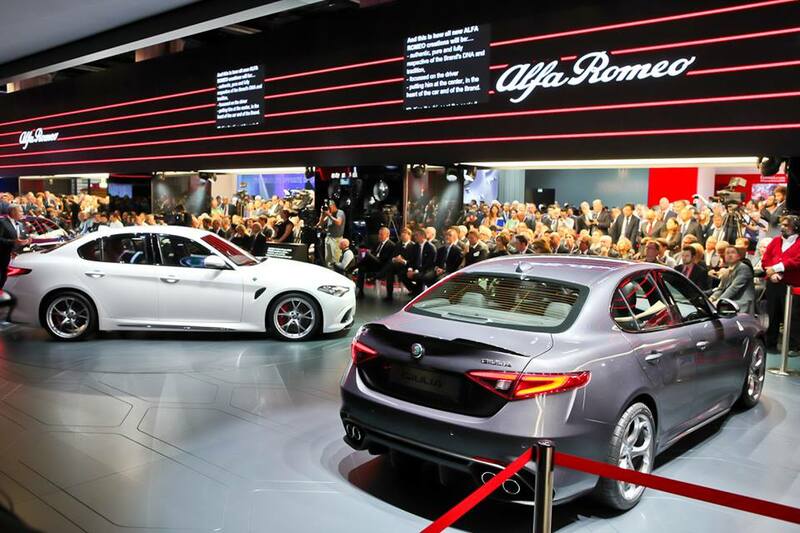 Alfa Romeo stand at Frankfurt Motor Show 2015. The brand presented the Quadrifoglio Verde with different trims. It was the same car that was unveiled in June. A good example of how slowly the brand goes on is Frankfurt motor show last month. Everybody was waiting for the reveal of Giulia’s rest of the range, the hot-selling versions, the one that will really bring people and money to FCA. However the brand showed the same car that was officially revealed 3 months before, leaving the audience waiting for more. Frankfurt 2015, and not Geneva 2016, was the perfect occasion to introduce the other Giulias. They didn’t and again, they lost time. They are working on the D-SUV to rival with BMW X3 and Audi Q5, but this car won’t be available in the dealers till early 2017. If everything goes well, by the end of 2017 the brand will be registering higher sales volume only if the public in USA and Europe demands the Giulia family (SW is expected as well), the D-SUV, and an updated Giulietta. Still, it is not only a matter of products. 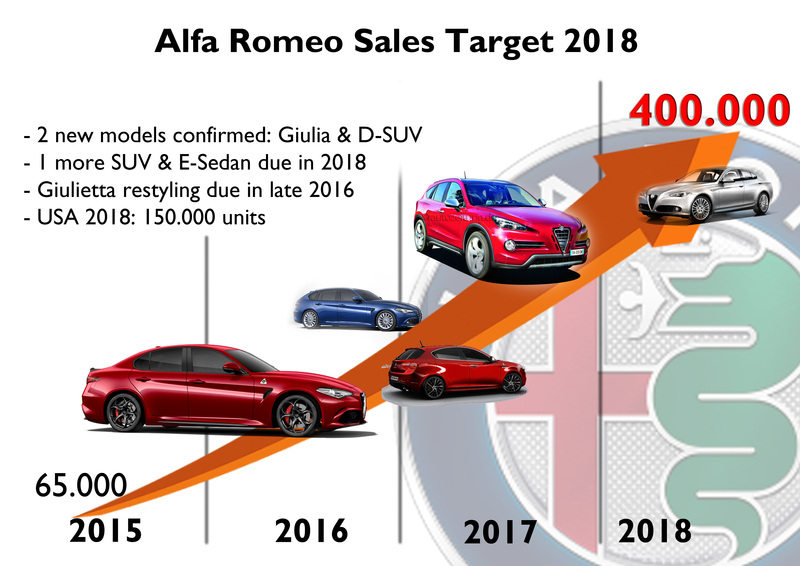 Based on Alfa Romeo’s official target, presented at the Investor Day in May 2014, the brand must jump from 65.000 units sold this year up to 400.000 by the end of 2018. 2 models are confirmed but they may not have time to achieve the goal. Awesome new cars don’t guarantee immediate success. Jaguar, Lexus, Infiniti and even Volvo can explain what Alfa Romeo would expect in the coming years. These brands are very good examples of how a non-German premium brand can survive, grow and find its place. They have invested lots of money on the development of their mid-size and large sedans and SUVs in order to increase the public’s awareness and consideration but sometimes it hasn’t been enough when your competitor is 5 or more times bigger than you. The race won’t be easy for Alfa Romeo especially when it wasted a lot of time, it played with its image and it let many of its clients to go away. Last year Jaguar unveiled the mid-size XE sedan in a massive event in London. The baby Jaguar is positioned right in the middle of the premium D-Segment, hence it is a direct rival of the successful Audi A4, BMW 3-Series and Mercedes C-Class. The brand has done a lot to position the XE as a real alternative to the Germans but its sales figures don’t show the same trend. 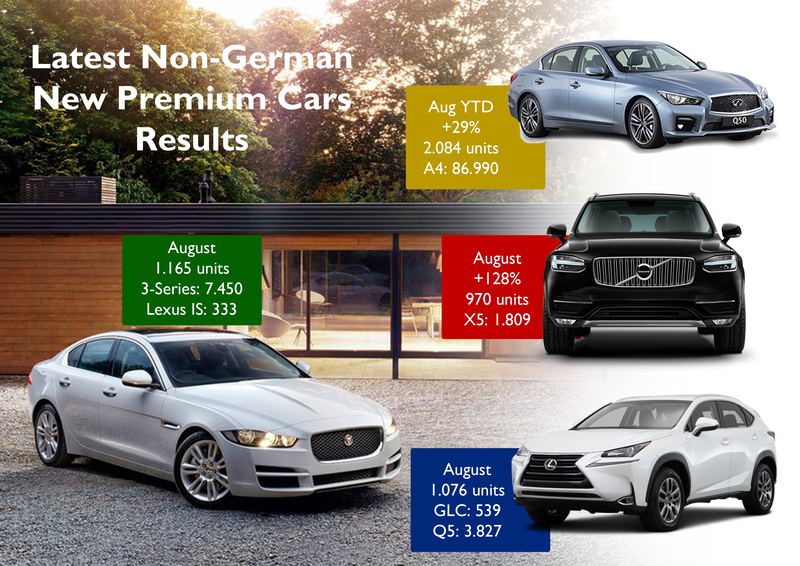 European August YTD data indicates that Jaguar has sold a bit more than 6.000 XEs in about 6 months. When compared to its rivals, the new Jaguar is even further: during August the aged Audi A4 (the new generation hit the dealers in September) registered 8.440 units while there were 1.165 XEs sold, according to JATO data. The comparison may not be fair considering the fact that the Jaguar hasn’t a range as big as the Audi’s and the XE was launched years later its predecessor died. Volvo, the largest premium car maker after the 3 Germans, knows also how is it to deal with its rivals. This brand targets 500.000 units by the end of this year thanks to the introduction of the new XC90, the success of the XC60 and the new versions of the V40, S60 and V60. But it’s growing not as fast as expected. 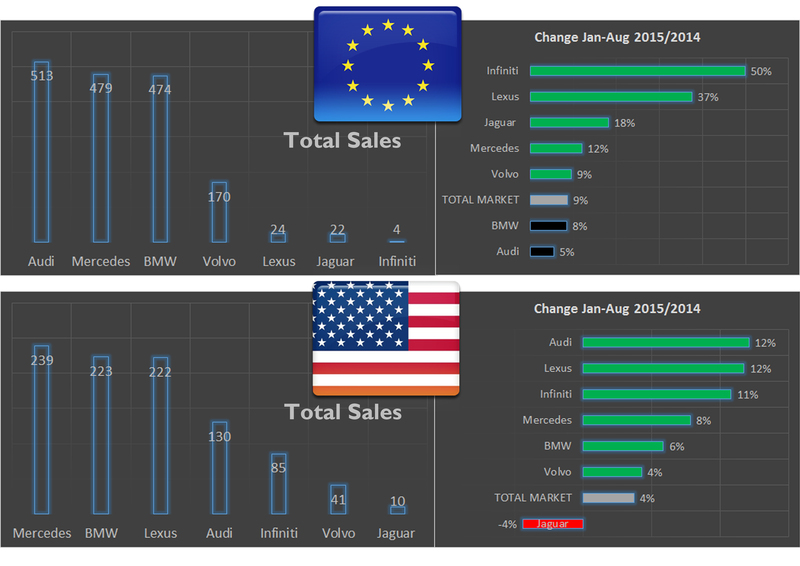 Till August, Volvo Europe sold 9% more cars than in the same period of 2014, whereas its sales advanced 4% in USA. The brand is doing better in China but once again it’s not only a matter of products. The cases of Lexus and Infiniti are even more complicated. With the exception of the NX mid-size SUV, all Lexus nameplates in Europe posted negative growths till the end of August. Infiniti, helped by Nissan and Mercedes, will try to conquer more European clients with the introduction of the Q30 compact hatchback and bring some volume. These 2 Japanese premiums struggle in Europe despite its wide range of new products, their quality and interesting designs. Alfa Romeo to take some notes. There were a lot of advance orders for the Gibli, too. Hopefully the Giulia can sustain the interest longer than the Ghibli. You’re just as biased as I am, in favour of Alfa’s success, but you, I and Sergio need to look at the reality that there’s no-way Alfa will hit his 400k target in this decade and possibly next.